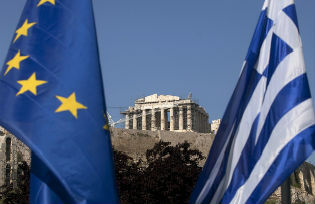 Whether the Greek elections this weekend trigger the Eurozone’s first exit or not, the possibility of exit is now firmly on the table. But where are the plans for this highly complex operation that could, if mishandled, cause untold economic damage in Europe and beyond? This column, by a Wolfson Prize finalist and a Nobel Laureate, sketches the core elements of one such plan. While a number of commentators have agreed with Barry Eichengreen that the “decision to join the Eurozone is effectively irreversible” (Eichengreen 2010), there is a risk that the ongoing game of brinkmanship on the future of the Eurozone could up being overtaken by the market. Even if all countries want to remain in the euro, there is still the possibility that some could be forced to leave. Companies, financial institutions, and more market-savvy individuals are beginning to fear a possible departure of a number of countries, the redenomination of bank accounts and bonds, and a subsequent devaluation. They are therefore moving their deposits and financial assets from the countries concerned to either Germany or outside the Eurozone entirely. This outflow of capital is starting to restrict the very investment needed by these countries to move from austerity to growth. And the weight of speculative capital flows could eventually force a country to leave the euro, in the same way that the UK was forced out of the ERM in the 1990s. • It is less clear that ECB and other authorities could offset a similar exodus for countries nearly 10 times the size such as Spain or Italy (especially if an earlier exit by Greece had shown that the euro is not ‘forever’). • Even if it were possible, creating such a firewall is not without risk for the ECB and hence ultimately for countries at the core of the Eurozone such as Germany. If a country were to eventually exit the Eurozone, the ECB could face a loss on the loans made as part of this firewall. The losses made by the Bank of England in supporting the pound’s peg in the ERM in 1992 offer a cautionary warning in this regard. It is unclear how much further resources core countries will be prepared to commit to firewalls, particularly given their substantial existing exposure though mechanisms such as the European Financial Stability Facility, the European Financial Stabilisation Mechanism, Emergency Liquidity Assistance, and the Target2 net claims of national central banks. Creating a larger firewall is only treating the symptoms of the problem. Policymakers should also consider treating the root cause of capital flight. They can do this by committing to the principle that, were a country or countries to exit, all euros, wherever they are in the union, would be treated equally. This could be achieved though the so-called “NEWNEY” approach laid out in the Wolfson Economics Prize entry (Cobbs 2012). The NEWNEY approach borrows more from corporate spinoffs as opposed to previous exits from currency unions. It was designed to allow an orderly transition of the Eurozone to two or more regions, some of which might be individual countries. • These new regions would have their own central bank, monetary policy, and currency unit, though the ECB could play a role in the transition. • Every euro would get exchanged for a basket of the new currencies at an agreed and fixed exchange ratio – the paper describes how this ratio gets set; everyone would receive a basket of the new currencies, and it would be up to them to decide what currencies to exchange them to. • The settlement value of existing euro denominated contracts and debt could continue to be determined by the exchange ratio and the relative value of the new currencies. Because all euros are treated equally, there is no incentive for capital flight and the process can allow time for migration to the new currency regimes – including potentially a referendum in some of the counties considering exiting the euro. Post-separation, competitiveness could be restored by the exiting country or group of countries managing a gradual devaluation, using higher nominal interest rates and inflation. Higher interest rates prevent a sudden currency collapse and stops currency flight. Such a gradually managed devaluation would provide a short-term boost in competitiveness, assuming wages did not rise at the same rate, in effect buying time to implement the austerity and structural reform measures that would still be required. In addition, any renegotiation of, or default on, debt could be managed quite separately. And, unlike with a crash exit, savers in the exiting countries are not penalised and speculators are not rewarded – indeed a crash exit is, as Christopher Pissarides has pointed out, very regressive (see Bloomberg article, Ryan 2012). Even if the euro remains together for now, there is the risk that the combination of severe fiscal austerity and an extended absence of growth and job creation will cause sentiment to shift away from Eurozone unity in a number of countries. Policymakers need a “Plan B” for how one or more countries could leave the Union and how to avoid the contagion of speculative capital outflows from peripheral countries. The NEWNEY Wolfson entry is a contribution to the debate on the design of this plan. But NEWNEY could also support the Eurozone remaining together as it reduces the risk of speculative capital flows that are already beginning to destabilise the currency union. So paradoxically, a plan designed to allow a member state to leave the euro, could help the Eurozone to remain intact. The real power of the NEWNEY approach might come from it reducing the chances of it ever needing to be used. Dobbs, (2012), “The NEWNEY approach to unscrambling the euro”, Wolfson Economics Prize. Eichengreen, Barry (2010), “The euro: Love it or leave it?”, VoxEU.org, originally posted 17 November 2007. Ryan, Jennifer (2012), “Pissarides Says Euro Exit Would Aid Rich Greeks At Cost To Poor”, Bloomberg.com, 30 May. 1. The Wolfson Economics Prize will be awarded to the person who is best able to articulate how to manage the orderly exit of one of more member states from the European Monetary Union. The Prize, which was created by Simon Wolfson, the CEO of UK FTSE100 retailer Next and UK Conservative party Lord, is worth £250,000 ($400,000) and so is the second biggest cash prize to be awarded to an academic after the Nobel Prize. The NEWNEY approach to unscrambling the euro, along with the other shortlisted entries, is available at www.policyexchange.org.uk. Catherine Dobbs received a BA in engineering from Oxford University. She subsequently worked in quantitative research at NatWest Investment Management and Gartmore Investment Management, developing investing and trading algorithms. She now divides her time between the South Korea, Thailand and the UK, and is an active personal investor. Michael Spence is a Senior Fellow at the Hoover Institution and Philip H. Knight Professor Emeritus of Management in the Graduate School of Business at Stanford University. In 2001, he was awarded the Nobel Memorial Prize in Economic Sciences.